The phrase ‘one thing leads to another’ is a pretty good explanation of my design process. 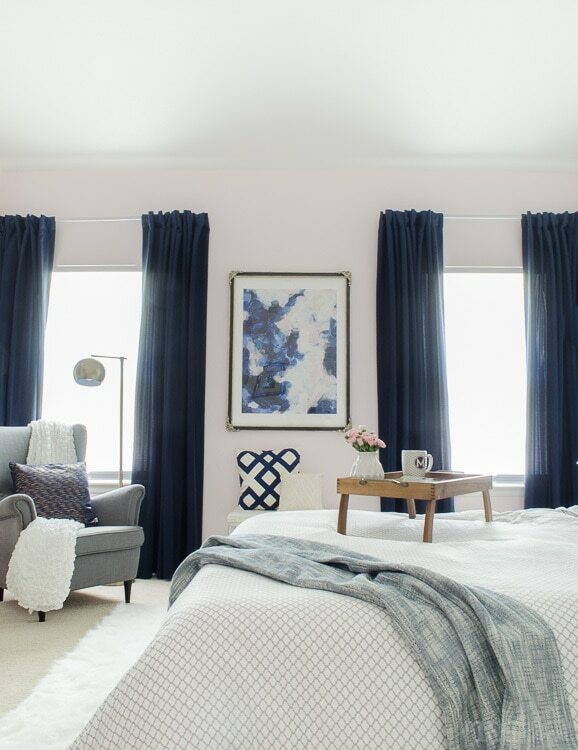 In the bedroom, the room started with one art print and evolved from there. 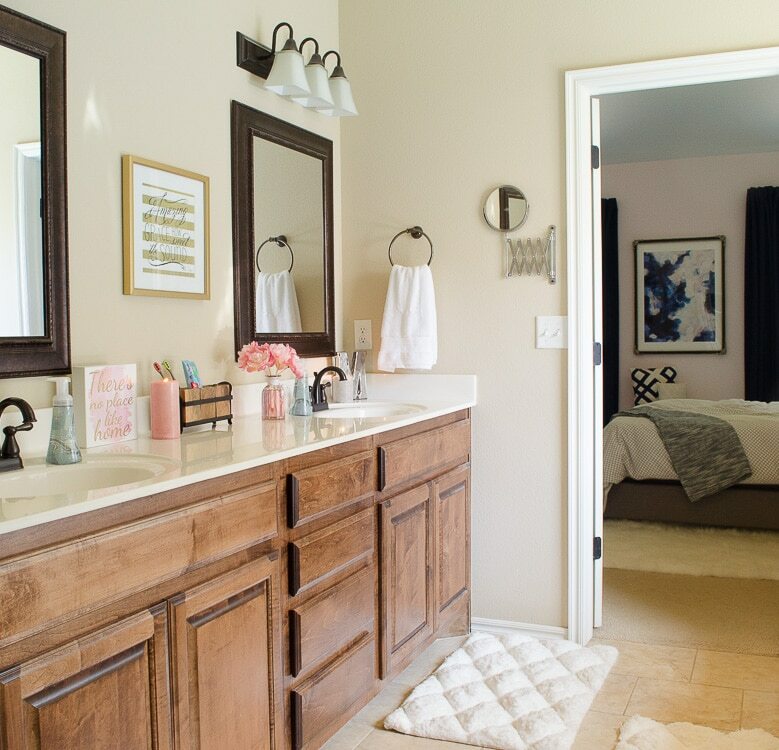 For the attached master bath, I’ve struggled to come up with an inspiration to pull the room together…until now! When I found the new KOHLER Composed Bathroom Faucet, things started falling into place. Look at this beauty! It perfectly converges all the different design feelings I love. It’s modern, yet timeless. It’s simple in shape, but would add high style to any bathroom. 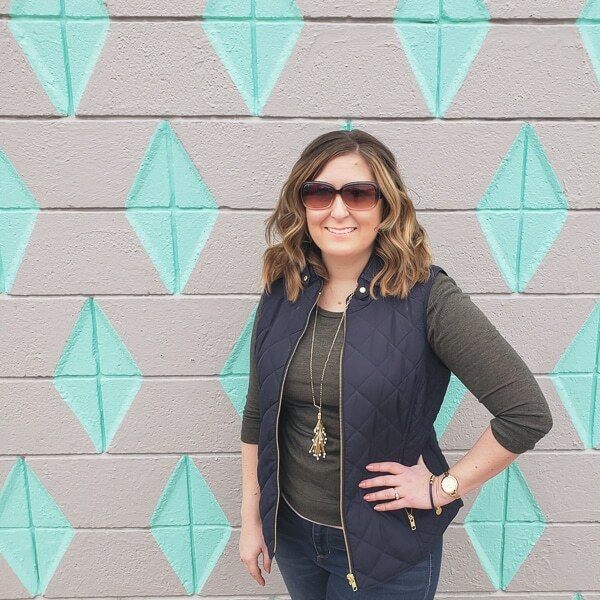 When we built our house a few years ago, I became overly obsessed with making choices that wouldn’t be outdated quickly. In the midst of that process, there were some good decisions like classic wood floors. But it wasn’t a perfect strategy. The biggest mistake I made was overlooking my love of inspired, modern design during most of the decisions. I tried to make everything classic and missed the modern edge. 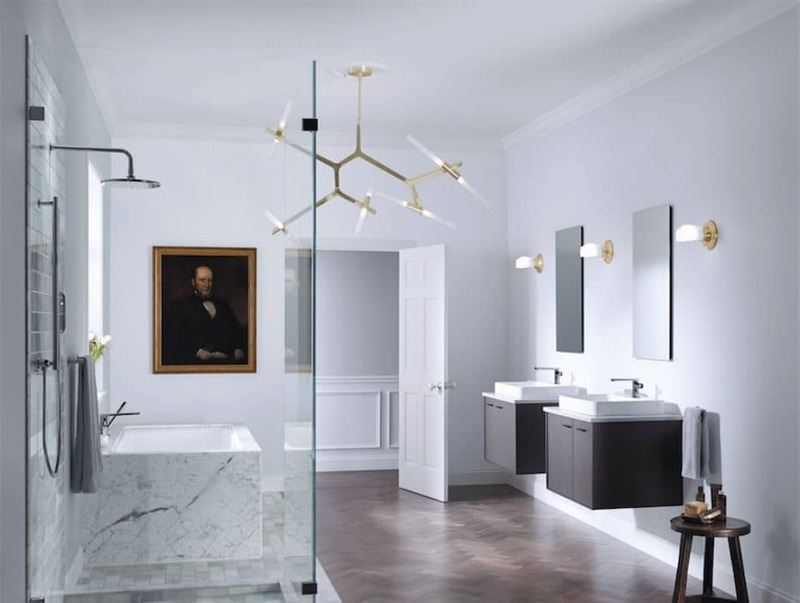 I forgot the simplicity of balance, which is something the Kohler team successfully focused on when they created this line. 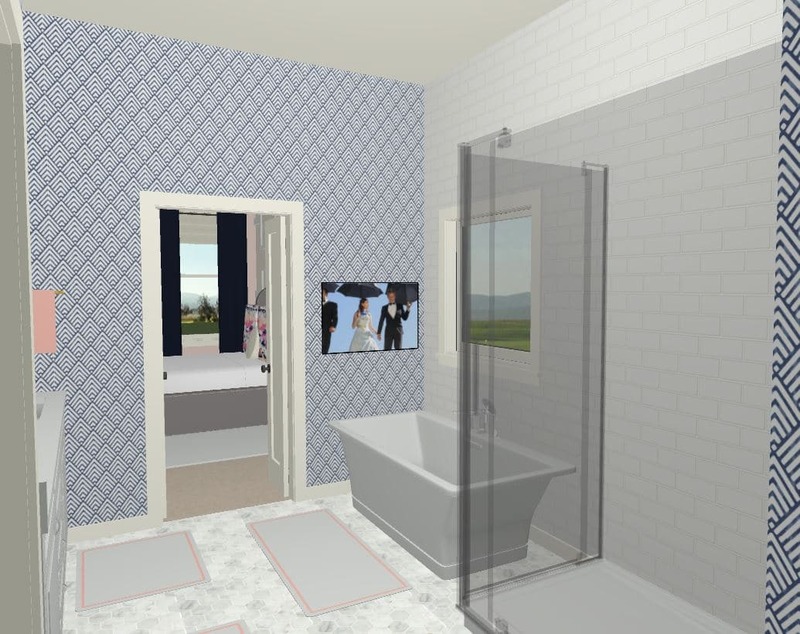 As soon as I saw the next image from Kohler, my master bathroom plans finally started flowing. 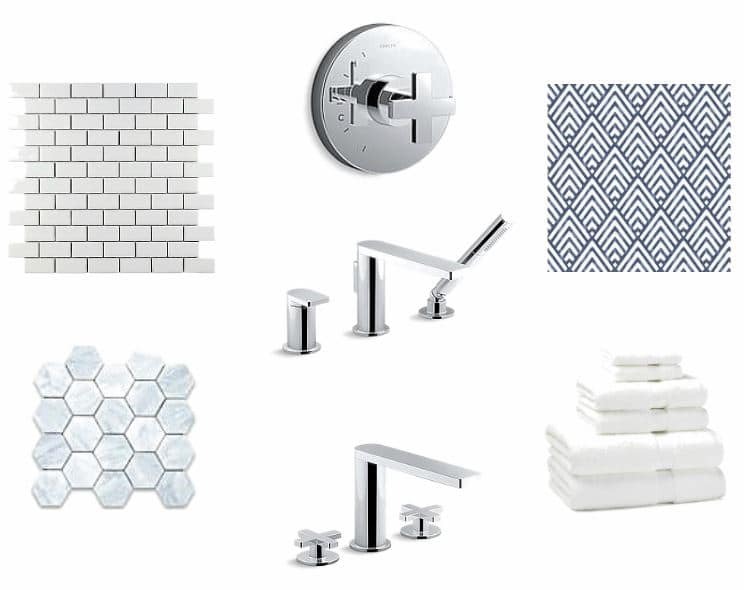 I needed something that felt both timeless and chic, just like the Composed faucets and the Kohler bathroom below. I started putting some ideas together, with the faucets in the center, letting one thing lead to another. As some of you could guess, I couldn’t stop there. I had to do a little mock up of what the bathroom could look like. As a reminder, the bathroom is a pathway between our bedroom and closet. The arrangement works perfectly, but since we’ve now updated the closet and bedroom, the current design of the bathroom is quite out of place. Here’s the floorplan. 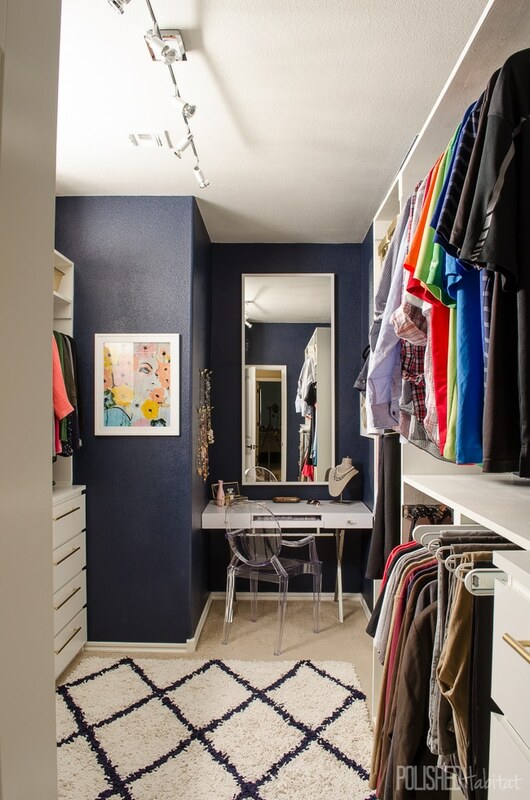 And the current closet as you enter it from the bathroom. And here’s the bedroom looking in from the bathroom. It makes no sense for the beige on beige on beige bathroom to live between those spaces. I’m still overjoyed to finally have a real master bathroom and am thankful for my tub every day. There’s a perfect balance between contentment and desire for long-term improvement in our house that I’m grateful to have. 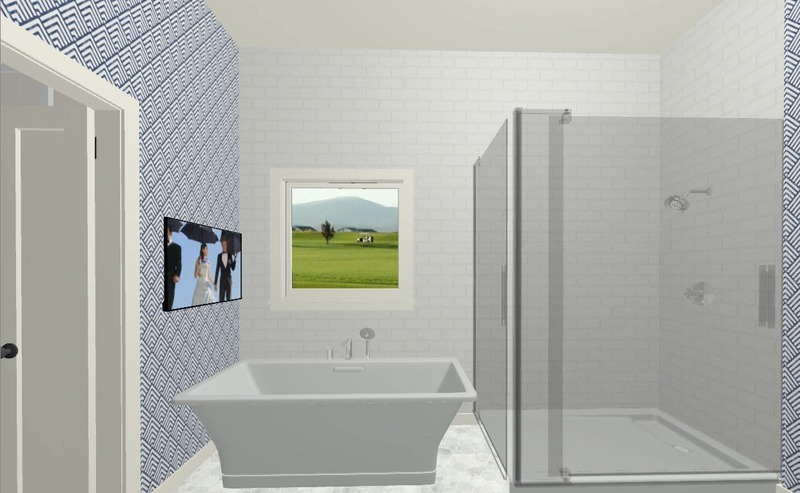 I’m not sure when we’ll have the budget saved to make these bathroom dreams a reality, but I love having a long-term goal. Here’s what the vanity side could look like from that same angle. 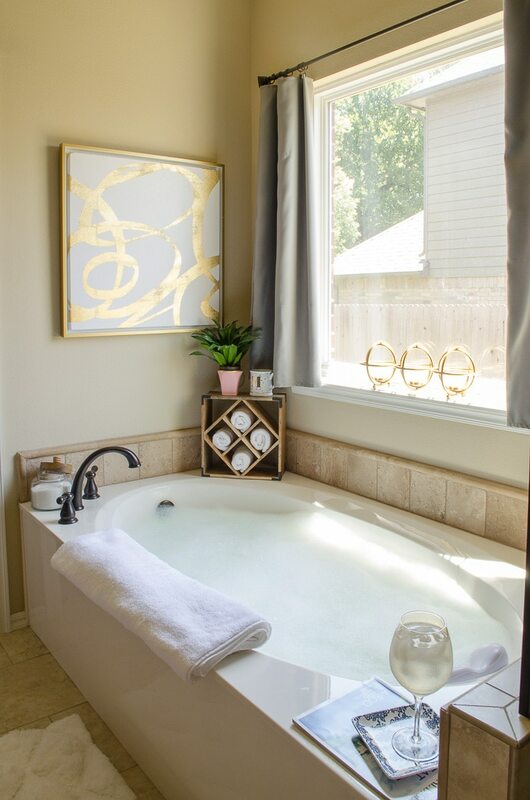 I love a good bubble bath, so I was excited to finally have a big bathtub in this house. But every time I fill it up, it bothers me that it is so much wider than necessary in the middle. 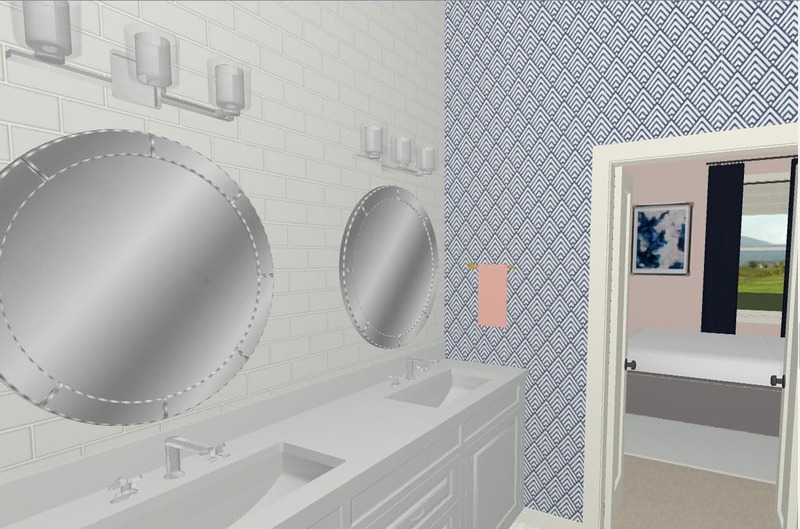 It’s hard to explain, but I feel like I can actually breathe easier looking at a future design of the bathroom compared to the current photos, which always means I’m on the right track. 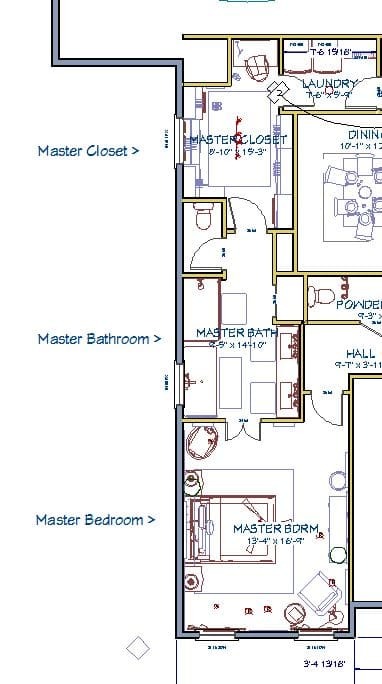 Now that I have a rough plan, I’ll be more disciplined in putting money aside for the master bathroom project. I’m not the best at saving for vague ideas, but when I can start to visualize the results, I get more serious. 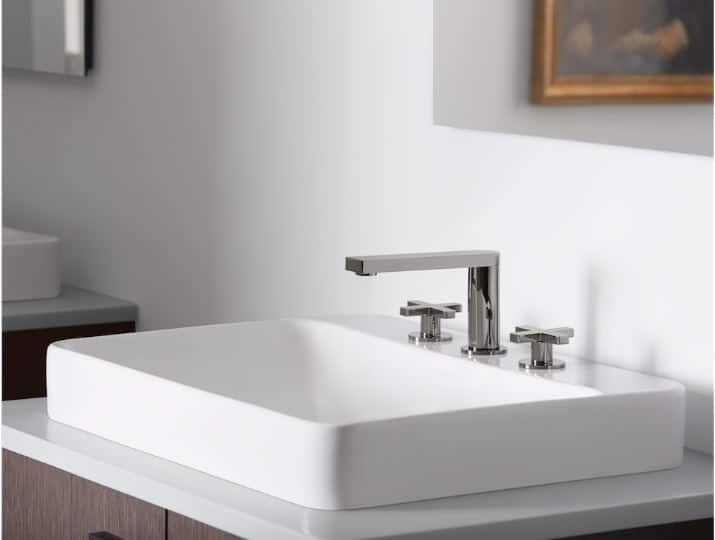 Since my whole bathroom plan was inspired by the Kohler Composed line, I wanted to circle back to show you the other amazing finish option they have available, Vibrant Titanium. I’m going to have a hard time choosing between this and the Polished Chrome. The darker finish has a moodier edge that I love. It would be a great contrast to all the bright white I’m planning. So many decisions! 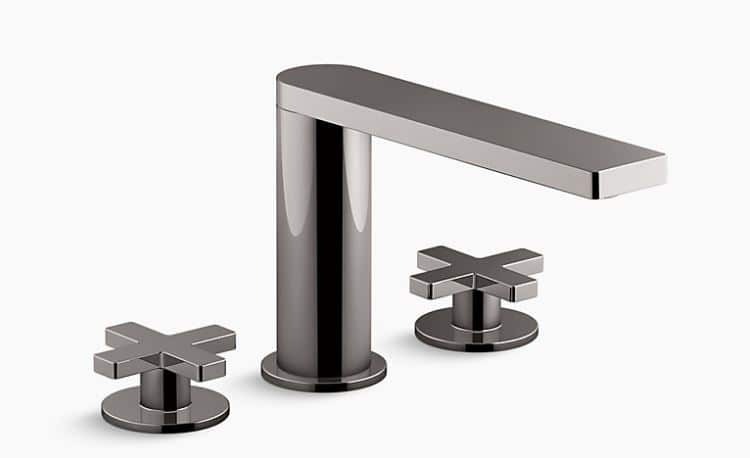 To see even more from the Composed line, check out Kohler’s site here. « Organizing Myths: Are they Holding You Back? Aren’t those X’s amazing!?! So modern and yet reminiscent of vintage faucets! The rugs came from Pier 1 online this summer. 🙂 They really are so thick and puffy! We got them when they were a brand new item for Pier 1 and some of them weren’t exactly rectangles. More like parallelograms. They are awesome enough that I’d still recommend them, just make sure you check them when they arrive to make sure you don’t need an exchange. I’m assuming they’ve got that defect well under control by now, but I wanted to give you the heads up just in case. 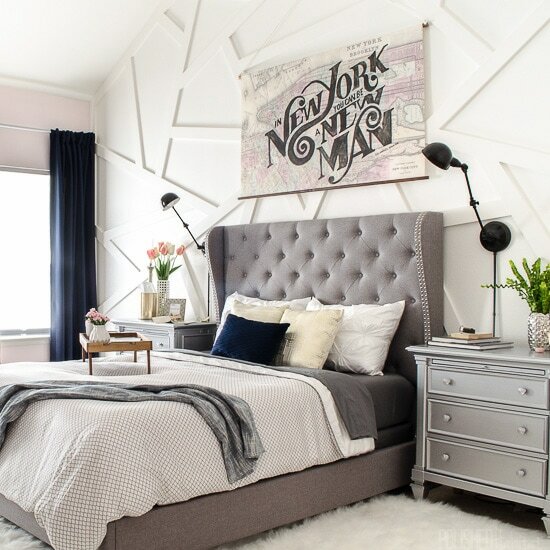 What is the wall design you have in your bedroom? It’s really neat! Our bedroom wall is an awkward shape as it has a sun window on a slanted ceiling. 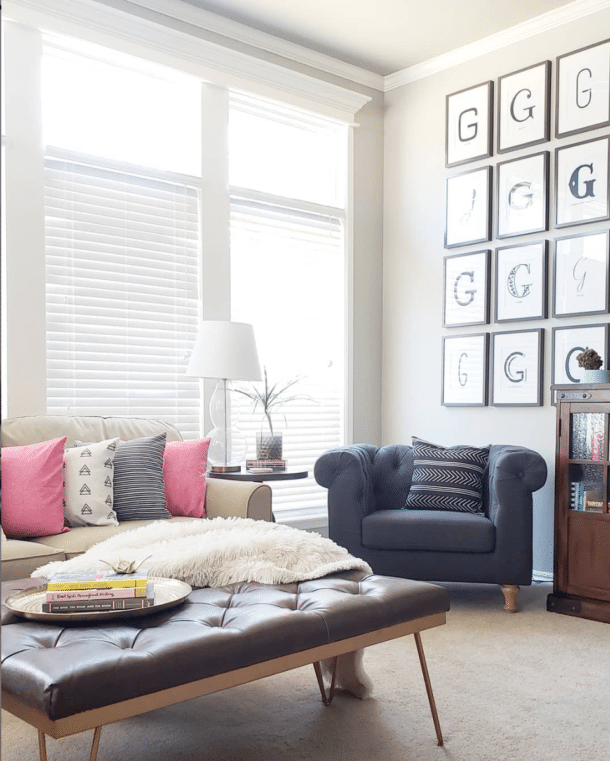 It would be perfect on an awkward shaped wall because it doesn’t have to be uniform like so many other wall treatments.